In order to test the eggs for contaminants, we first have to separate the egg contents from the eggshell. To do this we use a dremel tool to carefully cut through the eggshell, but not the membrane. We then lift up the piece of cut eggshell. Here, there is always a moment of hesitation: what will be inside? 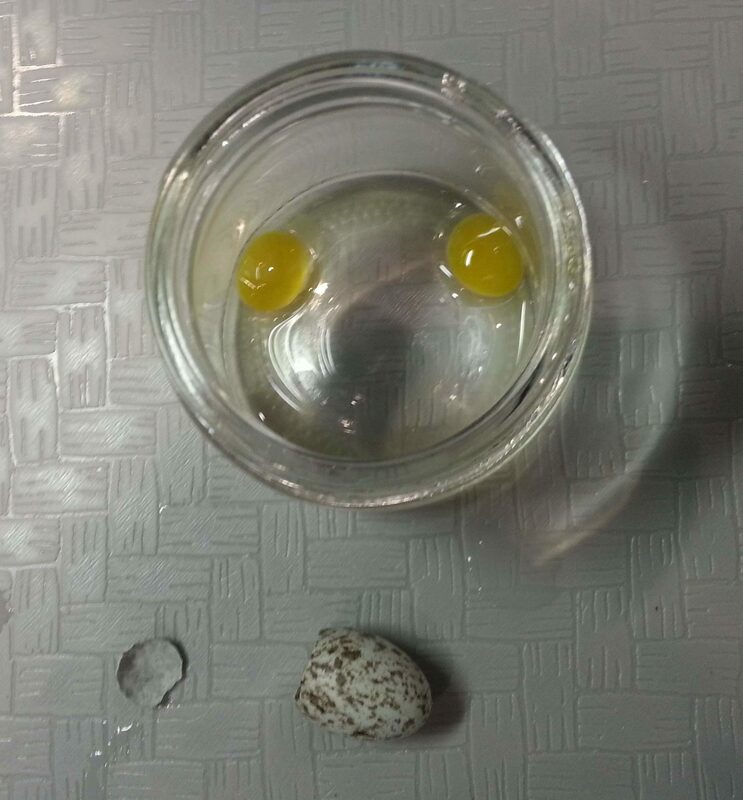 Sometimes we find a nice yellow yolk with a viscus albumen (the whites). However, as the eggs age, both the yolk and albumen start to break down making them runny. On other instances we find more developed embryos, and to be honest, the scene can be quite gruesome. The worst, by far, is a rotten egg. Sometimes just with the slightest touch of the dremel, the egg will explode sending shell and contents everywhere. For example, one of our middle school interns picked a piece of shell out of my hair. But occasionally, we will find something surprising. Like a double yolker! 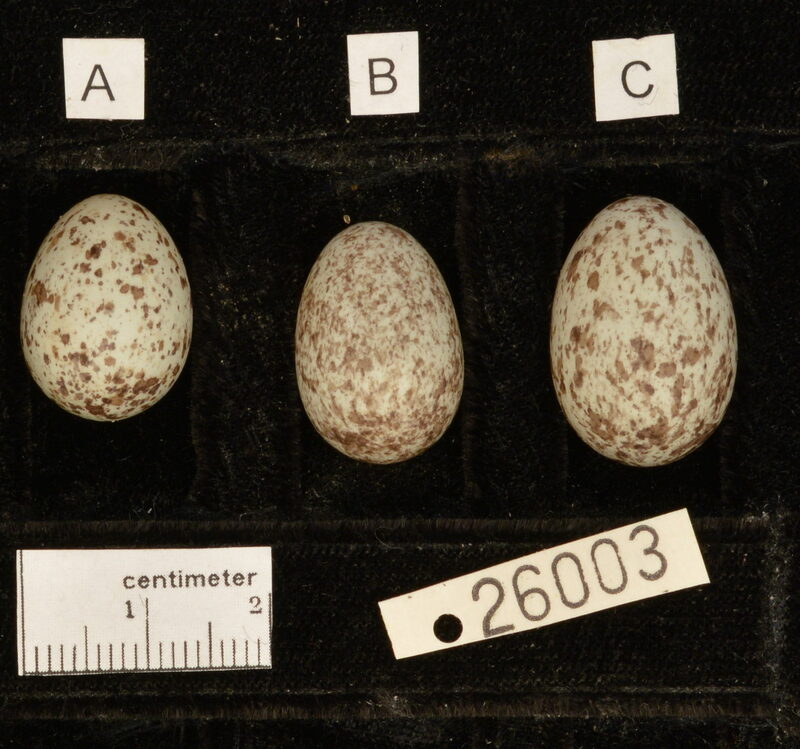 While taking photos of the clutch, Aubrey noticed that one egg was bigger than the others in the clutch (Egg C). When we went to curate it, we found not one, but two perfect yolks. I’m not sure anyone has ever looked at the odds for house sparrows, but for chickens the odds of getting a double yolker is about 1 in 1,000. Just as in humans, twin birds can be fraternal or paternal. If a female produces two yolks in a short enough time span (about three hours), than both yolks will travel through the oviduct together as one egg creating fraternal twins. If the embryo splits within the egg during development than the twins will be paternal. Most of these twins will die in the egg completing for the same resources. However, there are some cases where twin egg are able to successfully hatch! One of these cases happens to be in bluebirds! Back in 2013, a Nestwatch volunteer in State College Pennsylvania found more nestlings in a nest of bluebird than there had been eggs! Twins had successfully hatched! These rare occurrences can only be documented through having vigilant and dedicated nestbox monitors and naturalists around the world. This post was written by Suzanne Hartley, to learn more about Suzanne and the rest of the team check out the Sparrow Swap Team page.